Yacht shipping can be complex, with a highly technical and logistical team needed to successfully transport the yachts. Enter United Yacht Transport. Whether your yacht is worth several hundred thousand dollars, or tens of millions, it is critically important that you choose a yacht shipping company that you can trust. At United Yacht Transport, we have earned the trust of thousands of owners, brokers and yacht builders over the past five years. We have done this by offering world-class shipping services that are cost competitive, comprehensive, and always carried out with a commitment to safety, timeliness, and the best possible customer experience. We have a worldwide network of shipping partners so that we can provide industry-leading yacht shipping services to the boating community in the United States and around the world. Every single day we work with private owners, boat builders, and sales specialists who serve the domestic and international markets. Our team of experts help you can transport your boat to any destination in the world that has a serviceable port, so you are no longer limited to the waters around your closest marina. If you want the world’s best yacht transport service, then United Yacht Transport is the only name that you need to remember. This isn’t just a claim that we make. It has been proven throughout our history and we continually strive to improve our service. As you weigh your options for a yacht shipping company, we will provide all the information that you need to understand why United Yacht Transport is the preferred choice of yacht owners and industry insiders today. Shipping a yacht is a vastly different job to shipping standard cargo on a container ship. There is specialized equipment required, freighters and heavy lift ships that need to be modified to carry yachts safely and efficiently, and staff needs specialized technical and logistical expertise to load and unload yachts and to oversee the transportation process. It is perhaps the complexity that has led to yacht shipping being relatively niche. 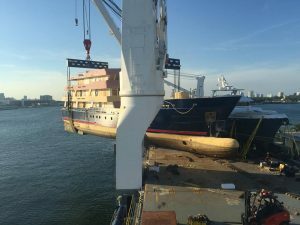 United Yacht Transport is proud to have been selected in April 2017 to transport the 185’ Expedition Yacht “Ulucitcan” from Port Everglades to Genoa. 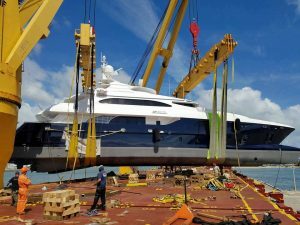 At 650mt, it was the heaviest yacht crane loaded by any yacht carrier in almost five years. The operation went flawlessly and the yacht was safely delivered. Our goal is to continue to not only meet the needs of our clients but exceed them in every way. This has led to continued referrals which have led to our growth. After seeing massive potential in yacht shipping, our founder Paul Haber left the investment banking world and set about creating the best yacht transport company he could. It was evident that there was room to develop better services that exceeded customer expectations, and in 2013, United Yacht Transport was formed. Based in Fort Lauderdale, our company operates in one of the busiest yachting communities of the world. Florida generates the bulk of yacht sales in the United States and is home to some of the world’s most prestigious boat shows. It is a fitting location for a company that is now considered the best in the country. Our mission is simple, yet it gives inspiration to our team members and drives everything that we do. We have a commitment to providing the most extensive yacht shipping network with more destinations than any other carrier. We deliver services at the lowest possible cost, operating on the principles of economies of scale. Our customer service must always exceed our competition. Yacht shipping is more than just moving your vessel. It is a relationship that requires constant communication and trust. We offer additional services and continue to develop more, including liner services and custom voyages that other companies simply can’t offer. We service every segment of the industry. From private owners to commercial operators, and even the boat builders themselves, United Yacht Transport operates without limitations. To put it simply, we strive to exceed expectations with customized yacht transport logistics and solutions. We have attracted the most experienced professionals in the industry, from loading specialists to logistics experts. Our combined experience spans decades of specialized cargo freighting and boat shipping. It all comes together to provide a service that is simply unparalleled in the market, and we are both proud of, and humbled by, the support that the yachting community has given us. Our mission and promise to our customers are the forces behind everything that we do, and a leading factor in our success so far. you need to know the reasons why you should be. We’ll say it again: we don’t expect your trust, we want to earn it. Our achievements in recent years can offer significant insights into what it is that we do, how we work, and why our customers consider us to be the best in the business. From our staggering growth to the milestone achievements in our history, these are some of the highlights that have led to us being the company that we are today. Things move fast in the shipping industry and we are fortunate to have achieved massive growth thanks to our logistical skill and are now renowned customer service delivery. 2018 has been a great year for us and one where we experienced record growth. So far in 2018, we have already broken our own records and continued to grow, expanding our business and improving the services that we deliver to our valued clients. Anyone in the yacht shipping world knows that this kind of sustained growth had not been seen before. 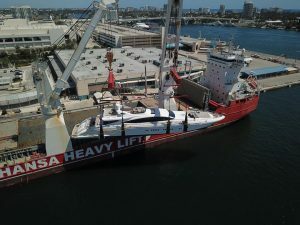 Just in April, we loaded four boats over 150’ on our Med sailing from Port Everglades to Genoa on the HHL Valparaiso, with the largest being the 165’ Mangusta. In 2017 we had a notable loading aboard the Industrial Guide, a heavy lift vessel that loaded in Port Everglades and discharged in Genoa. This was a landmark sailing, carrying some of the largest yachts that you will ever see in boat shipping. Two of the largest vessels were the 151’ Leopard and 130’ Mangusta. However, these weren’t even the largest on this sailing, that honor went to the 174-foot Ulucitcan, an Expedition yacht that weighed 650 tons. 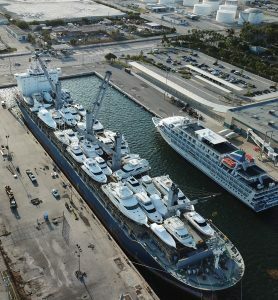 This was the heaviest yacht to be deck loaded with ship cranes by any carrier in the past five years. Even a couple years before this we were recognized by the Sun Sentinel. In total, ships loaded on the Industrial Guide were worth more than $200 million, indicating how owners of the world’s largest and most expensive yachts put their trust in United Yacht Transport. Months of planning meant that we were able to load both in the cargo hold and on deck, making for an efficient voyage where every possible inch of space was fully utilized. Recent years have seen similar sailings where we’ve broken our own records and those of the industry. We’ve lifted fully built mega yachts, in-build research and exploration vessels that are headed to Europe for fit out, and we carry brand new yachts that are delivered to boat shows and clients around the world. Our achievements have been vast, and our year over year growth has been phenomenal and more brokers and captains refer clients to us. The growth in 2017 and 2018 exceeded prior years and our Transatlantic shipping services became more popular. As founder Paul Haber put it, our sailings are “chock a block”, and we are continually increasing capacity and refining our logistics to meet our increasing demand. 2018 is already shaping up to be another record-breaking year, and yet again this is due to the trust and reputation that we have built in the yachting community. Leading customer service, industry-best logistics, and more sailings than other provider means that we can serve the needs of a yacht industry that is always growing. We’ve introduced our company, talked about our mission and what drives us, and even touched on some of our greatest achievements in yacht shipping. Of course, you could know all of this about our company, but you still need to know the right questions to ask where you are arranging for shipping, as well as the things that you should keep in mind when you are choosing a provider. As you consider United Yacht Transport for your boat shipping contract, keep the following points in mind. These will help when you need to ask questions, or even when you are comparing our services to other transport providers. Knowledge is key when you choose a service provider, and you should expect a yacht shipping company to be completely upfront whenever you have concerns or need some clarity about any part of the process. Where is the boat shipping company based? This can make a huge difference. If you are in North America, then it goes without saying that you should choose a North American shipping company. Why? Simply because a company like UnitedYachtTransport.com will have more understanding of the domestic market, the laws and regulations of domestic shipping, and the best routes/freighter partners to reach international ports. It is also important to have a local presence so you can meet the people that are transporting your boat and go over any logistical needs. Insurance Don’t be afraid to ask a yacht shipping company about insurance and the history of their sailings. Ask whether they have had incidents in the past, and what kind of process exists to address any such issues. All boats booked with United Yacht Transport are covered by marine cargo insurance from Lloyds of London. We have the best safety record of any yacht carrier and receive the lowest insurance premiums from Lloyds of London as a result. What Destinations are Available? If you need yacht shipping then you should have an expectation that your vessel will be delivered to a port that is convenient for you, no matter where it is in the world. Some transport providers operate with only limited networks, and the available ports may mean that you will need additional local shipping services to get your yacht to its ultimate destination. United Yacht Transport has a vast network of freighters and liners serving all the major worldwide destinations, and even some of the lesser known ones. Always do your research to avoid inconvenience and additional cost. Are Customs Services Offered? A yacht shipping service should always provide convenience. This applies not only to getting your yacht from point A to point B, but also to all the smaller details. A leading boat shipping company like United Yacht Transport will provide customs clearance services so that you can have full confidence that your yacht is compliant with all regulations at your destination port. Ask for a Boat Shipping Estimate. The cost of boat transport will vary depending on the destination, the size and weight of your vessel, and even the time of the year. Some factors like weather and fuel prices will impact the final shipping cost, so keep in mind that similar sailings provided at different times of the year (or in different years) can come with different costs. Always ask for a boat shipping estimate before you commit to a shipping provider. At United Yacht Transport we provide estimates of boat shipping costs so that you can make the right decision before you even commit to a contract. We are completely transparent in how costs are calculated, and our team is available to discuss all your options so that you can get the best price on domestic or international boat shipping. Special Destinations are also available on request. Our extensive freighter and liner services mean that we can get your yacht to the lesser traveled corners of the globe, at almost any time of the year. If you need to get a yacht to a boat show in Australia, or if you want to sail from New Zealand to the islands of Polynesia in the South Pacific, then United Yacht Transport has the logistics expertise and the network or carriers to get you there. Special destinations should be arranged well in advance, and we can provide boat shipping estimates before you commit to a contract. Keep in mind that unique sailings may come with longer lead times and increased cost, depending on the distance and the time of the year, as well as the availability of our shipping partners. Other popular destinations that are outside of our regular sailings include the Maldives in the Indian Ocean and the state of Hawaii. We can tell you all day about the belief we have in our company and how our shipping service outperforms others in the industry. We have mentioned trust more than once, and it’s hugely important to reinforce the fact that without the trust we receive from our clients, we never would have made it this far in the industry. One thing that clients have regularly commended us on is our communication and our ability to respond to issues that arise during the planning process. Shipping logistics are complex. Yacht shipping logistics are even more complex than normal. Yachts are oddly shaped, they have a weight distribution that is unique to normal cargo, and they range in both height and length. Arranging a sailing of multiple ships requires extreme attention to detail. Problems can arise in planning and during loading, and our teams need to think quickly and develop effective solutions to ensure that setbacks do not occur. We focus on the speed at which we were able to respond to problems and the professionalism with which our staff conducts business. Most importantly, we keep our clients up to date at every point of the process. Shipping your yacht can come with a high level of anxiety, after all, a yacht is a huge investment, and many owners have personal attachments to their vessels. You will see in our testimonials that we always respect the needs of our customers, displaying patience, expertise, and strong communication skills. We thank all our valued customers for the support that they have shown us since we started in 2013. They are a point of pride for every member of our team. We will always strive to impress our customers and leave nothing to chance when we are carrying out complex shipping assignments. With such incredible growth in our yacht shipping service, a positive response from valued customers, and milestones that have displayed how far we have come, it might be hard to imagine where we will take our company in the future. For the team at United Yacht Transport, the path from here is simple. We continue to focus on our mission and deliver a shipping service that exceeds the expectations of private yacht owners, commercial operators, boat builders, and sellers. We are continually developing ways to make our service more efficient, faster, and more affordable. Increasing our sailings has been a prime target, and the growth in our transatlantic sailings has been made possible thanks to months of planning. More sailings mean faster turnaround times, and increased capacity results in better boat shipping estimates. While growing our business, quality of service remains a major focus. Some companies that experience phenomenal growth will sometimes lose focus on quality, but that is simply not an option for us. We are trusted with over $200 Million worth of yachts on a sailing. There is simply no room to be lax when it comes to our safety practices. We have the best safety record of any carrier in yacht transport. This is combined with the lowest rates by Lloyds of London as a result. We will continue to expand our destinations as customer demand increases. The yacht sales market is on the rise, thanks to a growing economy. Growth is not just in the United States, but also in the international markets. Some of the world’s most exclusive clients and the world’s best boat builders trust United Yacht Transport to deliver to the busiest ports. When it comes to choosing a yacht transport company, we have covered the key points that you need to keep in mind. Ultimately, it comes down to some very simple factors. Do you want the world’s best yacht shipping service, do you want regular communication and the best logistical support, and do you want access to the world’s most popular destinations, as well as those that are less visited, with competitive pricing? If you can answer yes to these questions, and if you demand quality over everything else, then United Yacht Transport is the clear solution. Our teams are standing by for boat transport cost estimates and to answer any of the questions that you might have about our service today. For yacht shipping in North America or anywhere else in the world, United Yacht Transport is the company you can trust.